The corridors in The Rose Concordance by Angela Carr open onto the linguistic fountains of the Roman de la rose. The Roman de la rose (Romance of the Rose) was an extremely popular medieval French poem, whose initial variant was attributed to a writer de Lorris. A scholar, named Joseph R. Danos, then used this variant to create a concordance, that is a key word index, to the poem. The keywords are arranged in alphabetical order and under each keyword heading is a list of lines containing that keyword. Throughout the medieval age, the Roman de la rose was also copied many times by many scribes, and with each copy would have been altered, expanded, re-assembled, deleted, etc., bearing the marks of each copyist. The word copy comes from the Latin copia which means abundance, so one might say that the copyist doesn’t create simulacra but writes out of the spirit of abundance. I shall now copy “of the font to the fountain no avail” by Angela Carr. A concordance is a medieval search engine, based on principles of assembly and organization, amassed not through mechanical means but through the systematic means of a human hand. In writing from a concordance, using her human hand to forge English lines out of the medieval French, Carr does not obfuscate or cloud the dynamic of writing and translating, but rather enacts how they might each be part of the other, showing some of the ways a corridor of writing is a translation and how a translation is a corridor of writing. The Rose Concordance is a rubbing of languages and a conflation of time. The concordance’s indexical nature also leads to a compositional process in poetry that is indexical, infinitely generative, fountain-like. 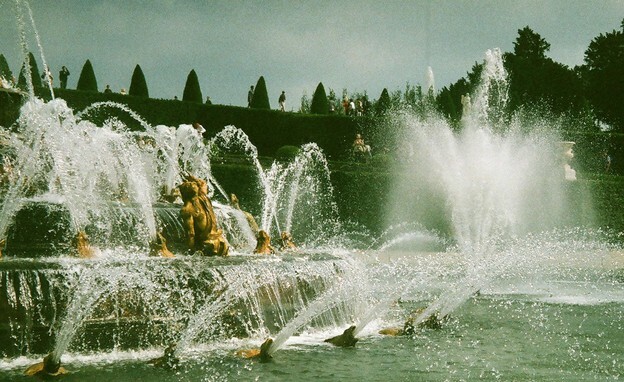 Fountains are corridors; water flows out in plumes, then collects, remixes and flows out in new plumes. It is always the same water, yet never exactly the same plume. “of the font to left haunting no avail” (Angela Carr) The Rose Concordance does not narrate; it generates. Giorgio Agamben, in the short essay Qu’est-ce que le contemporain? writes that to be contemporary with one’s time, one needs to be somewhat anachronistic to it; one only begins to see the contemporary from a point of difference or disjunct. “Le poète, en tant que contemporain, est cette fracture, il est celui qui empêche le temps de se rassembler et, en même temps, le sang qui doit souder la brisure.” For him, the poet is simultaneously a fracture that hinders time from coalescing and the blood that must solder this breach. The Rose Concordance stands anachronistically beside the concordance to the Roman de la rose, breaching time and languages, bodily/textually/erotically fusing a new linguistic fount. Poet and translator, Angela Carr, lives in Montreal. She has published two poetry collections, The Rose Concordance (BookThug, 2009) and Ropewalk (Snare Books, 2006). Her translation of Quebecoise artist Chantal Neveu's Coït is forthcoming from BookThug in 2012.